These Highlands vacation rental homes are located within a short walking distance of Main Street Highlands NC. This vacation rental home is tucked away into the lush trees on Oak Lane, in the middle of fantastic reasons to spend your next vacation with family and friends in Highlands, NC. Lounge on the beautiful front porch in this tastefully decorated home just minutes from downtown and right across the street from Harris Lake. 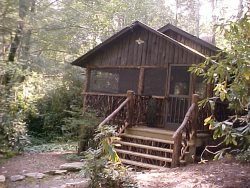 Enjoy this fantastic vacation rental home in Highlands NC located just a couple of blocks from Main Street.